As the days shorten and long hours of darkness lie ahead, there are plenty of ways to drive the chill away, and that includes enjoying some of the amazing performing arts options in Michigan. No matter your group’s preference, you can find everything from comedy to a theater to dance performed on gorgeous stages by gifted artists. Winter is the best time to enjoy the performing arts so here’s a rundown of six great possibilities for your next group trip. Now a landmark on the Michigan State University campus, the Wharton Center for the Performing Arts is considered a top venue nationwide and is also one of the most attended. Public fundraising for construction of the Wharton Center began with a kickoff event that included musical legends Tony Bennett and Lena Horne in 1975. On September 25, 1982, the Chicago Symphony became the first performers on the Cobb Great Hall stage and the rest is history. MSU was the first U.S. university to host “Les Miserables” and the second to host “The Phantom of the Opera,” both at the Wharton Center. Coming up are more fantastic shows, such as “Love Never Dies – The Phantom Returns,” and incomparable vocalists like Renée Fleming, comedians like Steve Martin and Martin Short (together! ), and orchestras from near and far. Find the perfect show for your group before they’re all sold out. To the southwest, near the coast of Lake Michigan, the Mendel Center at Lake Michigan College in Benton Harbor hosts a range of shows, concerts and other events that are well worth traveling to. The Mendel Center has two stages, the Grand Upton Stage and the Mainstage, each perfectly suited for breathtaking ballets like "The Russian National Ballet presents Sleeping Beauty,” and engaging performances like “Broadway’s Next Hit Musical.” If concerts are your group’s favorite, you’ll enjoy “Stars of the Sixties” (starring the Lovin’ Spoonful and The Buckinghams) or “Celtic Women: 2019 Tour” and enjoy the sounds of the Emerald Isle that earned the group a Grammy® nomination. And there’s plenty more to choose from so take a look and start a tradition. The Fox Theatre, which opened in 1928 as a movie house, remains the historic center of the arts in Detroit. Placed on the National Register of Historic Places in 1985 and designated a National Historic Landmark in 1989, it retains so much of the grandeur and opulence of the early 20th century it’s like stepping back in time to enter. At the same time, some of the hottest and most beloved shows and concerts ever are on tap in 2019 including “Rock of Ages,” “Rain – A Tribute to the Beatles,” “Rodgers and Hammerstein’s Cinderella,” or “The Sound of Music,” to name a few. The Fox isn’t just a theater, it’s an experience, and one your group won’t soon forget. Another fantastic performing arts venue to consider is Muskegon’s historic Frauenthal Center — originally the Michigan Theater — constructed in 1929 by movie mogul Paul Schlossman for “talking pictures.” Originally billed as “second to none in the United States for a town our size,” the structure is festooned with gold, griffins and cherubs, and full to the brim with ornate plasterwork and a suspended ceiling. Renovated several times over the following decades, most recently in 1998, the Center now encompasses an entire city block. Due to the diverse artistic goals of the Frauenthal Center, your group can experience a range of performances and events, from the speakeasy-style “Alley Door Club” series to comedians like Larry Joe Campbell (from the FOX series Orville) to the “Magic of Bill Blagg Live” and diverse musical performances. With two professional stages, your group is sure to find more than one choice that is trip worthy for all. Two impressive Grand Rapids venues work in tandem to bring some of the nation’s (and the world’s) best to Michigan — Van Andel Arena and DeVos Performance Hall. Seating 12,000, Van Andel Arena has attracted some of the biggest and best in music (think Paul McCartney, Elton John, Eric Clapton, and Taylor Swift) as well as entertainment like The Harlem Globetrotters, Cirque du Soleil, and sporting events like NCAA Hockey and World Wrestling Entertainment. DeVos Hall, as it’s known, has more than 2,400 seats and regularly hosts the Grand Rapids Symphony and Broadway Grand Rapids productions such as “On Your Feet!,” “School of Rock,” and “The Book of Mormon.” Special performances upcoming include musicians Harry Connick Jr. and John Mellencamp, and dancer Derek Hough. Don’t wait! Get your tickets today! 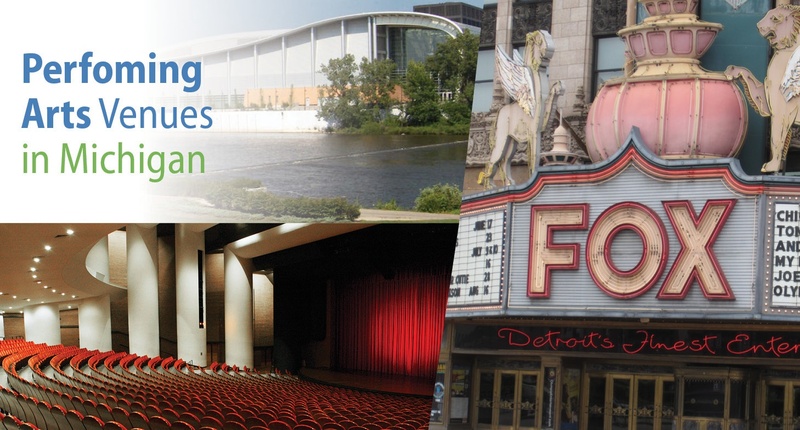 Each of these Michigan performing arts treasures are sure bets for a great trip with your group during the chilling winter months. Once you make the perfect choice, don’t forget to book the best bus in the business — Indian Trails. We look forward to serving you!